Bailey Girl 22" and Bailey Boy 22", a lovely couple bears make a great gift who can afford to give them plenty of loves and bear hugs. 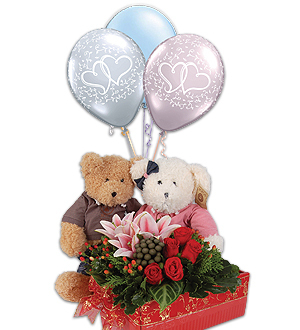 Presented in a box of Lilies, Roses and 3 latex balloons. Let the memory linger long after the last flowers has wilted away.